Shortly before Walt Disney World opened in October 1971, I began to notice construction of a new theme park on the west side of I-95 north of Ormond and Daytona. It was Marco Polo Park, and I believe it opened a few months before Disney. The developers of this park were probably counting on snaring some of the visitors traveling down I-95 on their way to Walt Disney World. All parks were themed in those days, and this park's theme was based on Marco Polo's legendary travels through Europe and the Far East many hundreds of years ago. I took my kids there and it was a lot of fun. The park had rides, movies, music, puppet shows and a lot of other attractions. A little steam train ran around the perimeter of the park. Marco Polo Park pioneered what Disney would do years later with Epcot. The park had various "worlds": Turkey, India, China, Japan and Venice. Ethnic food was served in a couple of restaurants. The first phase was opened in early 1971. The Japanese gardens had several sampans made of teak that carried visitors along an artificial waterway and under ornate oriental themed bridges. The park cost only about $2 or $3 for adult admission, something less for the kids. Alas, most of the tourists the developers hoped to snare on their way to Walt Disney World drove right on by and didn't spend their bucks at Marco Polo. Marco Polo Park closed in 1975 after a couple of bad fires did a lot of damage. It opened again later that year, but under the name "Passport To Fun". That didn't work either, and the attraction closed for the last time in 1976. These days you can't see a trace of it from I-95. There is a residential community on the property now. Great seeing memories of Marco Polo Park - I lived in Flagler Beach and so many of the beach kids worked there in the summer. So much fun! Animal Land is listed as being in Palm Coast but Palm Coast did not even exist yet. The area is known as The Hammock and is in an unincorporated area of Flagler County. Years after Animal Land closed, we used to go in the woods on the ocean side and climb a huge hill that overlooked a natural Artesian spring and jump off a rope and swim all day long. THEN when the yankee infiltration of Palm Coast began, the county capped off the Artesian well and life as we knew it was never the same again. Sometimes "progress" really bites. There were several small attractions including the Monkey Jungle in The Hammock back then and great souvenir shops like the Sea Shell Museum & of course our beloved Marineland. I worked there so many summers when we had thousands of visitors every day. Then along came I-95 and the mouse. The Hammock is not and never will be part of crime ridden Palm Coast. Great memories. You are correct about Palm Coast not existing back in the Animal Land days, but we couldn't figure out what else to call "The Hammock" so that other visitors to the website would understand where it was. Painters Hill, Beverly Beach, Marineland? We also preferred that area before the Palm Coast development turned the ITT pinelands into a giant city. But that's the sad story of Florida and why we try to give people a glimpse of how it used to be. In late 1973, the year I graduated from college, I took a job with Leisure and Recreation Concepts (LARC) in my hometown of Dallas, Texas. They were planning to get into the theme park business in a big way, and their first big job was to be Marco Polo Park in Daytona Beach, actually about 10 miles north of Daytona Beach. My best friend, who also worked for them, and I went down early in 1974 to help open what was to be the biggest and, as it turned out, the final major expansion of Marco Polo Park, which had already existed in another form for several years. I started out in merchandising but moved to live show when the park opened. We had a great time working there, although the park did have its problems. It never really found the audience that they hoped it would get. I made a lot of great friends working there, some of whom I am still in touch with. I did a number of things when I worked there, including replacing members of the puppet show team when somebody was out, and also inhabiting the body puppet of Marco Polo that would walk around the park and greet the guests. Man was that suit hot! In 1984 I had occasion to go back and visit the area and I slipped in through a gap in the fence around the property and walked around the site for about an hour. There was not much left, but there were a couple of train cars, one stacked on top of the other, and I could see the track for the little drive-it-yourself cars that ran around. It all was kind of sad, but it also brought back some great memories of that summer ten years before. I left the area in August of '74 and have always had fond memories of Daytona Beach and Marco Polo Park ever since. 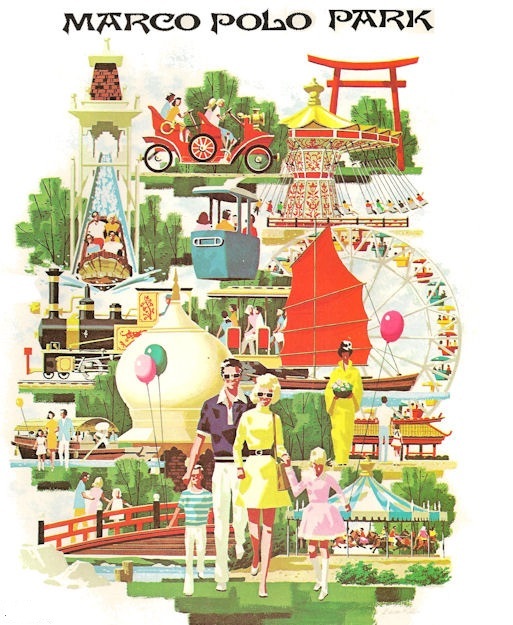 Bruce, thanks for this wonderful word picture of what Marco Polo Park was like in its heyday. I still believe the park would have succeeded if Uncle Walt hadn't opened his big show in Orlando. I worked for a company in the late 70s and early 80s and I came down to Florida to Marco Polo Park and helped bring it back to Cambridge Ohio where it became part of Paradise Lake. Went there when I was eight years old. Now I'm 54. Was going through some old boxes and found an old decal that's still in package and in good shape. Imagine that! Was my first summer job fresh out of H.S. and ready for adventure after moving to Daytona :) Still have friends from those days and 41 years later I married my best friend, he was one of the puppeteers. My brother worked there. He was in a donkey costume. Very apt, lol. I also went there on a double date. I love this park! My mom worked there and we were able to play before it opened. Many of the ads have pics of me and my sister. The Skyway was my grandfather's favorite, he would ride it all day. I loved the swings the most, it was like flying. The films and Dragon ride were close seconds. The centrifugal force ride was not a favorite but rode anyway. I loved the strawberry icee..yum. MOP was a lovely and fun family park. I treasure my time there and all the memories. Thanks. We camped at a nice camp ground near there in 1976. I can't recall if was a Yogi Bear or other camp ground. It was a beautiful place. I do recall old amusement park rides across the street lying on the ground. They were mostly covered by vegetation at that point. We've lost all our pictures of that vacation. Such wonderful memories. Does anyone recall this campground ? Did it go out of business? If so, When ? My grandparents lived in Daytona and we lived in Jacksonville. We would spend time with them in the summer, and one year they took us to the park. I remember and still think of it today. It was a fun place. Lots to do and a really beautiful atmosphere, and the e price was right! Wish it was still here today, Disney has out-priced a lot of people ever being able to visit. Jacqui, I agree with you and wish there were more affordable attractions in Florida. I worked on the construction of Walt Disney World and used to enjoy taking the kids there in the early days. Just a couple of years I took myself, two kids and two grandkids there and it cost more than $400 just to get in. Who can afford that? They had the best log ride! You could guarantee that you would get soaked. We went a lot-even when we were on the way to Disney, and sometimes when we couldn't afford to go to Disney. For many years after it closed I looked for remnants of the park until finally you couldn't see anything anymore. The closest thing to it now is Wild Adventures in Valdosta. My parents never took us to Marco Polo Park, proclaiming it to be a big fat ripoff. But one place they DID take the four of us kids to was Animal Land. The short-lived Animal Land was on A1A in the area of Palm Coast that is called The Hammock. It was wonderful. It was this big outdoor animal preserve with roads through it. The animals wandered around behind great big cyclone fences and we would ride these open-air safari wagons. Alas, it seemed it was open for less than a year. The main building became the Palm Coast offices. I went there on a school trip. i think it was my eighth grade. I am now 53 years old. I remember the huge ferris wheel. Oh, what memories. Saw this park but never visited it. Thanks so much for reminding me of this place. I was a flight instructor at Embry-Riddle back in 1971 and I remember taking my girlfriend at the time, who lived in Fort Lauderdale, to Marco Polo Park. The Japanese gardens and especially the Kabuki Theater are the most vidid memories and I had completely forgotten the name of the park or where it was at until I found this web site. I just moved back to Florida last year. I really wish that Disney had picked a different location for his "mouse trap". A wish like that and a few dollars will only get me a cup of coffee maybe LOL..